And the guest strips just keep on coming! What can I say, I figured if I’m out of commisssion, then it’s just good manners to give you as many great guest strips as I can. Give thanks to Josh Anderson for his contribution. 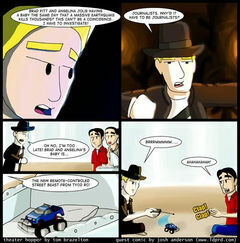 I loved the Indiana Jones reference in the second panel as – in real life – I tend to invoke that quote whenever there is an obstacle that impedes me from doing whatever it is I wanted to do. Mowing the lawn, for example. "Dandelions. Why’d it have to be dandelions." Be sure to check out Josh’s web site L.A.P. Dance Productions. In addition to comics, they have some great digital shorts, reviews and all-out rants. Lots of quality content to be found there. I have one more guest strip for you tomorrow and then it’s back to work on Monday. Hope everyone is having a great weekend. Cami and I were threatening to see The Break-Up on Friday night, but the negative reviews kept us away. We’ll see what the word of mouth is. I dunno, is it just me or is Jennifer Aniston incapible of playing anything above Rachel 2.0? She needs to do something like The Good Girl again and quick. If we see this movie at all, it’ll be for Vince Vaughn. Chances are we’ll catch a matinee of X-Men 3 on Sunday. We actually saw it in France on May 26 – one whole day before you! Booyah! Downside was that (even though were had our fingers crossed for English with French subtitles) it was completely in French. We did a pretty good job following along, though. Big, dumb action movies like that… you’re only job is watching things explode. But like I said, we’ll catch the matinee in English to pick up on the more subtle points. 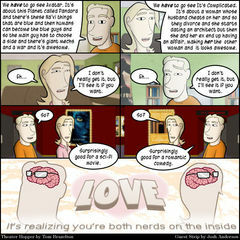 I gotta give it up to Josh Anderson from Game U and his excellent guest strip. When I put out the call for guest strips, Josh was the first to answer. I’ve been sitting on this strip since October 27 – which is even more amazing when you consider Josh had the presence of mind to reference both Avatar and It’s Complicated. 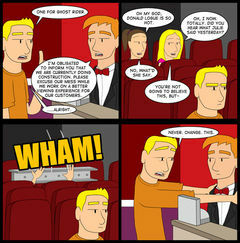 I wanted to publish Josh’s comic earlier to reward him, but he made it so darn timely! Plus, he found the sweet spot when it comes to the relationship stuff I like to hit on from time to time with Tom and Cami. All around excellent work that needs to be rewarded by everyone visiting Josh’s site, Game U. Let Josh know what a great job he did! Not much of a status update for me to talk about except that we’re just trying to get ourselves organized for Christmas and visiting family. Apparently, Iowa is supposed to be slammed with freezing drizzle, ice covered roads and blowing snow over the holidays. So even though we don’t have to travel far, it’s making everyone anxious. We’ll see what happens. It would be nice if we could get away for a couple of hours to see a movie. Cami is very interested in seeing It’s Complicated and I have to admit – despite the fact that it’s another piece of affluent copper kettle fluff from director Nancy Meyers – I’m interested in seeing it, too. I’m sorry, but you can’t bring together a cast like Meryl Streep, Alec Baldwin and Steve Martin and just disavow it. That’s some A-level talent right there. All of them are actors I admire. I’m also very interested in seeing Sherlock Holmes. Although I imagine it to be the exact opposite of It’s Complicated in nearly every way. Guy Ritchie’s films are all about unchecked, sweaty machismo. Meyer’s films are all about women with authority and fabulous kitchens with unchecked square footage. I think Ritchie is a director that has never really lived up to his potential. He delivered something unique with Lock, Stock and Two Smoking Barrels, but he’s never been able to match it. I don’t expect Sherlock Holmes to reverse that trend for him. Still, it’s got Robert Downey Jr. and Jude Law and – from the trailers – they look like they have some really interesting chemistry. So even if the film looks like the sloppy backwash of The League of Extraordinary Gentlemen, I think we’ll still be treated to some good performances. Last thing I’ll leave you with for today – we’ve been making some AMAZING strides on the fund raising campaign for Theater Hopper: Year Three. There were some big pledges over the last couple of days and want to extend my SINCERE THANKS to those of you who have lent your support. As of this posting we are 87% funded with a measly $460 left to go! I’m feeling confident that we can raise the few remaining dollars, but I don’t want to rest on my laurels. We have only ONE WEEK LEFT to make goal. If we don’t, then I won’t see ANY of the money and the book will likely never be published. If you haven’t pledged to the fund raising campaign yet, please pledge today. With the holidays approaching, I’m concerned that we’ll lose momentum or that people might forget about the campaign. Even if it’s only a dollar, it gets us that much closer to goal and will hopefully inspire others to put us over the top! In the meantime, expect another guest comic here on Friday. If you’d like to leave your thoughts about It’s Complicated or Sherlock Holmes below, I’d love to hear them! What movies are you planning to see over the Christmas holiday? Will you cross the gender aisle and see both films? Let’s talk about it! Wow! When I announced on Tuesday that I was looking for guest strips to help flesh out the last few weeks of Theater Hopper, I didn’t think I would receive a comic the very same day. But that’s exactly what Josh Anderson from Worsted for Wear pulled off – and it’s hilarious! 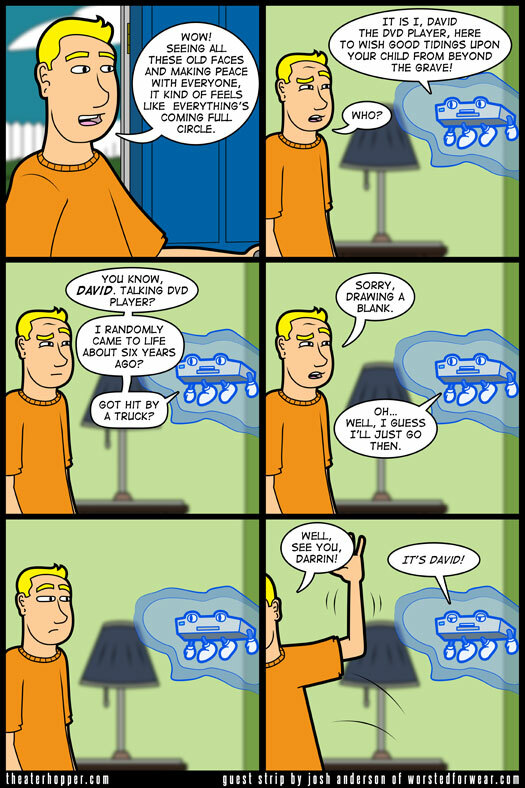 If you’re kind of new to the site and don’t remember David, I encourage you to check out his first appearance from back in 2006. What follows is a short story arc that takes to task the interesting phenomenon in webcomics at the time where household appliances were gaining sentience and becoming full-fledged cast members. I always thought the idea was kind of dumb, so I wanted to poke at it a little bit. I did that by quickly killing David off four strips later. I wrote David back into the strip briefly in a story line where Shia LaBeouf used him to attack Tom. It was a case of mistaken identity. The story line was actually a fabrication on Tom’s part to explain how he had damaged his hand and had to go to the emergency room. That was my funny way of incorporating a real-life injury I had inflicted on myself back in 2009. So David’s appearance was more of a cameo than an actual reappearance. I assure you, he’s still dead. So, now that we’re all up to speed on David, take a minute to thank Josh for his excellent work and check out his comic Worsted for Wear!